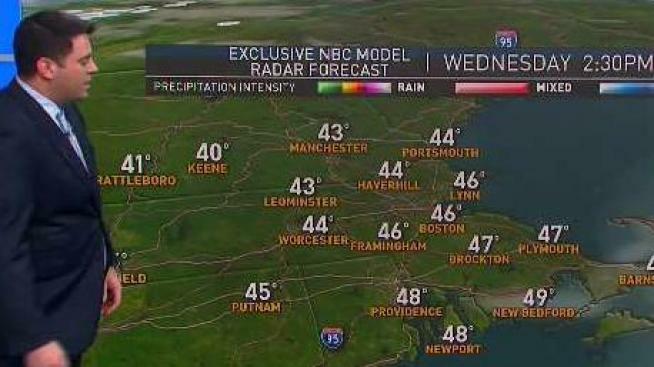 Showers to midday clouds to afternoon breaks of sun. Temperatures fall through the 40s. Overnight Wednesday: Mostly clear. Lows in the 30s. Lingering showers on the back edge of this system on the Cape & Islands as well the midcoast to Downeast Maine, otherwise, it’s a mild start to our Wednesday under partly cloudy skies. Clouds depart and the skies are mostly clear by the afternoon as temperatures drop through the day. By midday, expect temperatures in the 40s south and 30s north. Thursday and Friday brings even colder conditions. Get ready for highs near 40 Thursday, followed by highs in the 30s by Friday. Plus, the cold blast sticks around through the weekend and even into the extended 10-day forecast. Speaking of this weekend, a system is expected to develop along the coastline of the Carolinas and will continue to slide up the eastern seaboard. It could just clip eastern New England by Saturday afternoon since the jet stream, which is the atmospheric river of strong winds in the atmosphere, drives this system up the coastline. As it meets up with the colder air mass overhead, we’ll likely see some rain/snow showers closest to the coastline, Saturday afternoon into early Sunday. However, most of the energy and moisture will be way off the coastline. Far western New England will just be in the cold this weekend. For the extended forecast, next Tuesday and Wednesday looks to bring some accumulating snowfall as well as gusty winds, both days. Be sure to stick with NBC Boston and necn to give you the latest details on the potential impacts of that storm as we get closer.